Get ready to flip over this Belgian waffle maker (get it? flip over... J)! Hamilton Beach has always been a leader in kitchen appliances and now they have created a beautiful, brushed stainless steel flip waffle maker that should not disappoint. Coming in right around $40, this waffle maker is a great deal for the Hamilton Beach line. 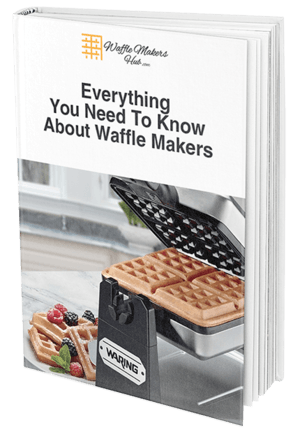 With deep Belgian waffle trays, indicator lights on the top and bottom of the machine and removable drip tray, this waffle maker has all the standard bells and whistles I look for. So let's take one of these waffle makers for a test run and see how it does! Check out our YouTube video to see the Hamilton Beach Flip Belgian Waffle maker in action then read our review! At first glance, I immediately noticed the larger handle on this waffle maker which is designed to be easy to grip and, according to the box, is heat resistant. It is easy to hold and because it is all plastic, it shouldn't get too hot when the waffle iron is on but it is a little bulkier than some other comparable flip Belgian Waffle Makers (For example, see my review on the Oster Flip Belgian waffle maker, which has a collapsible handle). The polished stainless steel makes this Belgian waffle maker look sleek and modern (it will certainly look nice sitting in my kitchen!). There is a removable drip tray that is also dishwasher safe and the deep Belgian waffle iron grid claims to be non-stick- I always love waffle makers with easy clean up! A green indicator light on the top and bottom of the waffle maker should help make preparing waffles extra easy which is great for rushed mornings when my mind is going in a million directions- no time to think about how long the waffles have been cooking- thank you Hamilton Beach for the green light! The heat setting knob on top is also helpful in hopefully preventing me from burning any waffles! When I opened the waffle maker (using that nice big handle), I did notice that the machine is a little shaky and didn't feel very sturdy. It did make me a little nervous that I could burn myself when opening or closing the waffle maker if it suddenly shut! See our video review here to see what I mean. So How do The Waffles Come Out? I plugged in the Hamilton Beach waffle maker, set the dial to medium heat, and waited about 3 minutes before the green indicator light went on and I was ready to make some Belgian waffles! I used our standard amazing waffle batter recipe and poured in 1/2 cup of batter which was the recommended amount for this machine. Closed the lid, gave the waffle maker a 180 ̊ flip and waited for my waffles! No batter leaked out which means that 1/2 cup of batter was the perfect amount for this waffle maker- and my drip tray stayed clean! After about 4 minutes, the little green light went on again telling me "Hey! It's waffle time!" . The machine easily flipped over and the top lifted off cleanly (no batter sticking to the top) to reveal some very crispy looking, browned waffles! The waffles easily lifted out of the waffle maker and looked pretty perfect on my plate. The Hamilton Beach Flip Waffle Maker looked as clean as when it came out of the box- it's so great to have basically no clean up in the mornings! Perfectly cooked waffles, no mess and breakfast is ready in about 8 minutes flat- sounds like a win to me! The waffle maker itself is a little shaky and propping the top up while I poured the batter in made me nervous that I could get burned. The waffle maker is a little bulky and takes up a good amount of kitchen space - not a problem if you have a nice big kitchen though! The Hamilton Beach Flip Belgian Waffle Maker cooks up some perfect waffles! The indicator light works as it should so it will take you minimal effort to make great waffles- just take them out when the light tells you to. Easy to use and easy to clean- what more can you ask for! This Belgian waffle maker is a great choice as long as you have the kitchen space to store it. Still have questions? Watch our video review here to see the Hamilton Beach Flip Belgian Waffle Maker in action.